In Native American culture, it’s customary to compose a death song early in life. A chant meant to be recited during times of danger and at the time of death itself. By chanting a death song during times of peril, one is awaiting their fate with courage and enlightenment. 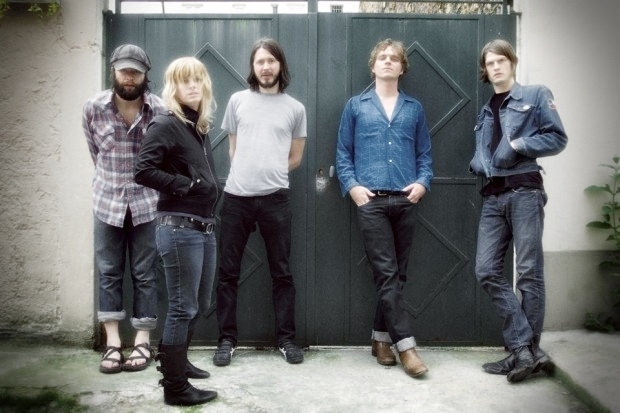 The Black Angels might’ve titled their fifth album Death Song, as a call back to their Velvet Underground influence. But taking a look at the current state of America’s politics, taking the death song cue from Native Americans, doesn’t seem that far-fetched. Despite references to war in past albums, I’ve never considered The Black Angels a political band. During their inception post-911 – pre-Obama administration, it would be next to impossible for a band not to reference political themes. However, The Black Angels have focused on the more personal aftermaths of war such as paranoia and uncertainty. Those very themes are once again present in Death Song, but no longer in past tense. It’s all happening first hand. “Currency” opens Death Song with The Black Angel’s signature pulsating droning before ripping into their most menacing guitar riff since their first record. “One day it’ll all be over. One day it will all be gone” warns the chorus. A stark reminder of how the neverending pursuit of money rarely ends well. The social commentary doesn’t stop there. “I’d Kill For Her” masks itself behind traditional Jefferson Airplane stoner rock, but beneath the layers reveals the danger of blindly following political parties. From a technical standpoint, The Black Angels have fine tuned their knack for eerie musicianship with Death Song. In the past few years, the garage-psyche genre has blown up in popularity. Bands like Dead Coast and Reverends have put out far better albums than The Black Angels’ previous effort. Staying relevant in a genre a band helped make popular is no easy task, but tweaking the formula and adding a layer of political commentary has worked wonders. At its core, Death Song is a protest album but in the most unconventional sense. I recently wrote an article citing the correlation between monster movies and the love Vietnam War-era music, the latter being something The Black Angels seem well versed in. During turbulent times, both civilian audiences and soldiers clung to the hope found in protest songs. Artists sang of the same peace as listeners, begging the world to put their differences aside for the greater good. Whether it worked or not is debatable, but peace was eventually found, even if only superficially. How does that greater good factor in today? With poisoned water, segregation, sexism, oppression and general civil unrest, are protest songs good enough? It’s a question that makes Death Song so interesting. It’s hard to say where the country will end up in the next few years. Maybe the uprising of protesters will force the powers-that-be into listening to the people, maybe they won’t. But just as the Native Americans chant their death composition for enlightenment in times in peril and ultimately death, The Black Angels have given us our very own with Death Song. Ehhh, I think you’re reading way too far into it.